I often get asked ‘when can I start running with my dog?’ and I never really know how to answer this. I’m not an expert on the skeletal development of all the different breeds of dogs and I think my answer would vary depending on a number of factors. Firstly, all dogs are individual therefore an element of common sense has to be applied, for example I would say a dog who is going to be big boned and heavier when fully grown should be allowed to develop longer than a dog who is much lighter in both structure and weight. As a rule of thumb competitions do not allow dogs to enter below the age of one year for canicross and (in general) 18 months for bikejor and scooter. Sled dog club competitions have slightly different rules but the same basic principles apply and a year is the earliest you will see any dog in competition. The reason for this is to allow your dog time to mature physically, which is the most important as your dogs growth plates need to be fully developed to prevent any injury. It also gives your dog time to mature mentally too. 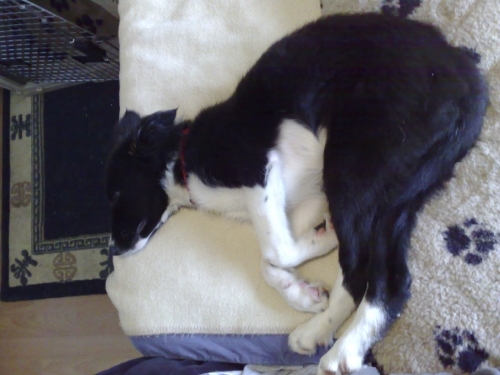 It can be quite a lot for a young dog to take in with the stress and excitement of a racing environment, at even a year old and many people find their dogs don’t really come ‘into their own’ until they are 18 months to 2 years. So it would be safe to assume that if your dog is allowed to compete at 12 months then you should be training before any races but how far in advance of this? Again I think this will depend on your dog. I have chosen different stages to start my dogs off at in harness for different reasons. My first dog was about 16 months when I first ran her, she was rescued at about 9 months, spent 3 months in kennels and she needed time to settle and adjust mentally before giving her a ‘job’ to do. My second dog was rescued at 4 months and was suffering with malnutrition and worms, he needed a long time to build him into firstly a strong puppy, then a strong dog. I started running him at about 13 months when he had developed good strong muscles and I could see his head was ‘in the right place’. Then came my third dog who was well muscled and strong at 6 months, this was obviously too young to start running him in harness but he was mentally and physically stronger than both my other two at 6 months, just not fully developed in his bones. With the go ahead from my vet I started very short distances with him at 10 months and built up from there. More recently with the addition of my forth dog, I had the opportunity to start getting him used to a harness from 11 weeks and although he did plenty of walking in his harness and learning the voice commands, he still didn’t start running properly with me in a ‘grown up’ harness until he was 11 months old. All my dogs get regular checks with the vet and now have a Canine Massage Guild therapist who ensures they are not getting strains. All 4 are around 20 kgs in weight so not big, heavy dogs who could potentially be putting additional pressure on their joints by running in harness too young. Unfortunately I get a lot people asking for a proper running harness for their dog at around 9 months old and I end up turning people away. At 9 months old your dog will still have a lot of growing to do and if you purchase a harness that fits at 9 months I can almost guarantee it won’t when your dog is 18 months! It’s not just because your dog will still be growing structurally in this time but it will also be laying down muscle and if you are working a dog in harness it will almost always change shape at this age too, bulking up around the neck and shoulders. I recommend starting your dog on short runs in a simple, lightweight harness to begin with, to get them used to the feel of pulling in a harness and also to teach them the basic voice commands while attached to you. Once your dog is happy and comfortable with short runs in the harness, you can then build up the distance and by the time your dog is about a year old, it will probably be ready for it’s first ‘proper’ running harness. 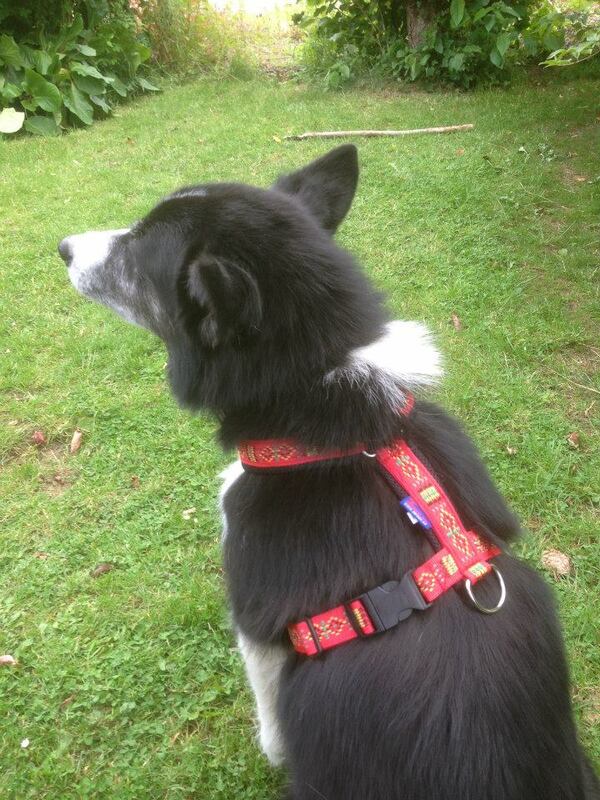 I then suggest using the first harness as a walking harness or a spare for other people or dogs. Of course not everyone has the budget for two harnesses and that is why I will always advise someone to wait if they are unable to purchase both a training and a proper running harness. Waiting also allows you to observe the way your dog runs and can provide more useful information then for choosing the most suitable harness for your dog to run in for the rest of it’s life. This is all my own opinion of when you should start running your dog but this is based on years of both canicross training and racing. I have seen people racing their dogs too young in spite of the fact they are technically old enough and it just leads me to the conclusion that you should make your decision based on your dog and not what anyone else tells you is appropriate. If you’re in any doubt, just wait. There can be no harm done to your dog by taking it slowly and allowing them plenty of time to grow. There is a great deal of harm however, that can be done by rushing into it and doing too much both physically and mentally. Keep it short, keep it fun and keep it simple to ensure you and your dog always enjoy the experience. This entry was posted in General, Training and tagged Canicross, running with dogs, starting canicross, young dogs. Excellent post!! There are so many differing ideas of when to start running your dog. 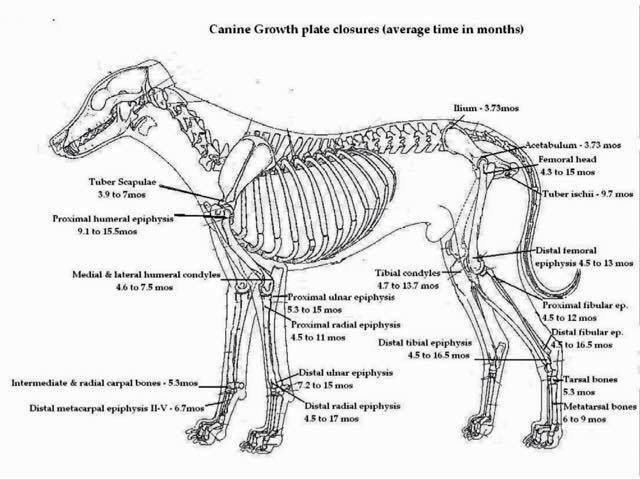 I have never seen the diagram of the growth plates before, it is so interesting. I went with the cautious approach and waited until about 18 months to start running with my dog. I really cringe when I hear about someone running a 6 month old larger breed dog for 5 +miles. I hope those people come across your post.